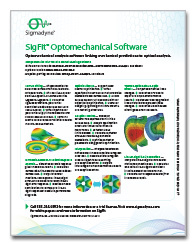 SigFit’s variational analysis capability allows users to predict the statistics of optical performance due to the effect of statistically characterized disturbances. SigFit uses finite element simulations of anticipated variations such as dimensional, force, and mass variations in combination with their means, variances, and probability distribution type to perform Monte Carlo analysis yielding probability distributions of various optical performance metrics. Performance metrics for which results may be obtained are rigid body motions of optical surfaces, polynomial coefficients, residual surface RMS and P-V errors, and change in radius of curvature. In addition, SigFit can generate optical analysis input files for all Monte Carlo realizations considered. This allows users to conduct their own subsequent Monte Carlo analysis in the optical analysis software.